You know what's better than a penpal? A foodie penpal! That's right! I was reading all kinds of blogs one night and stumbled across the awesome the lean green bean blog who hosts the foodie penpal. It is easy to sign up and there is no cost or hidden agenda behind it - only the love of sharing food! Spend a max of $15. You can make some treats, send some local food, anything you think is fun and creative. Your box must also contain a handwritten note, recipe, etc. How fun! You must mail your box by the 15th of the month. If you have a blog, post about it on the last day of the month. When I first read about FoodiePenpal, I discovered that it was limited to those in the US or Canada however, I thought I would try anyways. I figured if it didn't work out that I could sign up again when I moved back to the States. Well, lucky for me someone from Denmark also signed up. We were paired up and started e-mailing each other. Since we weren't a part of the official foodie penpal USA side, we were able to do things on our own time table, which was kind of nice. I was able to gather some goodies from Korea. I bought some things and I also managed to acquire some food goodies at school too. I packaged up a soy milk box (like a juice box but soy milk), spicy cold noodle mix, rice cake treats, Korean citron tea, some sweet things too and off to Denmark they went. I was a bit nervous as Korean food can be a bit different if you aren't used to it but I got an e-mail from my foodie penapl saying she loved the snacks. My foodie penpal travels for business so the swap took a bit longer but was well worth it as I received a package from her this week. She was in California and sent me some food from a coop. 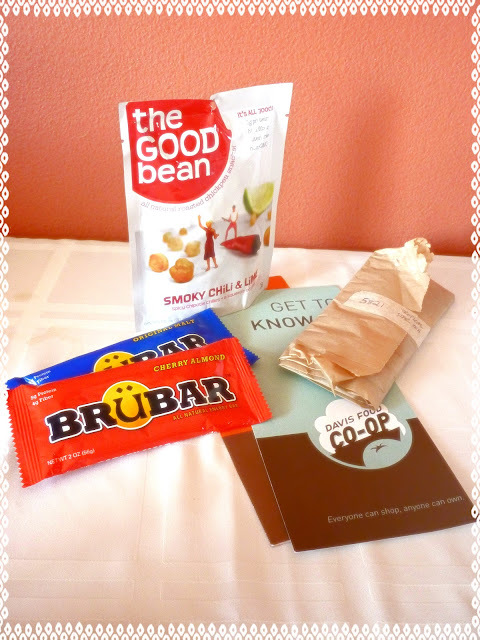 Here is what I received: all natural energy bars (cherry almond and original malt), smoked chili and lime chickpea beans, some tropical star tea, a nice hand written note and some info on the coop! So awesome!!!! I also feel like a made a new friend. Another great thing about foodie penpal is that you sign up monthly. When you sign up you only have to commit for that one month. Also, each month you are paired with someone new. My foodie penpal is from Denmark and we have e-mailed about continuing to send each other some things. I also plan on signing up here States as well. I'm so glad I stumbled across this program as it is really fun! I can't wait to send and receive more fun food across the nation and globe! I highly recommend it! If you are living internationally and can't find a foodie penpal send me an e-mail and maybe we can have a swap.